It IS a bit on the expensive side, priced at about USD 100. But it is solid and sturdy, and folds small enough to be carried easily around with my tuba on my back and my other equipment in a wheeled suitcase. 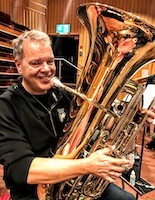 Have a nice tuba day! Personally, I keep a Konig & Meyer KM101 ($35) slipped under my vehicle's driver seat (as most venues/organizations supply stands, or - if not - I'm still not willing to carry anything more than a collapsed KM-101 from my vehicle into a venue). There's apparently also a K&M super-lightweight aluminum version, now, for a couple dollars more, but (having seen alumimum this/that/the-other fatigue over the years) I prefer to stick with steel. Though the black KM-101 offers a nice rectangular wire desk (which looks even better with black leatherette folders sitting on them), one year - when a quintet with which I was involved played several nighttime (formal) recitals on a tour at churches (where we couldn't be certain that five Manhasset M48's might be on hand), we brought along some of these 1/8" thick 24" x 12" sheets of textured black plastic (which easily fit in the 10"-tall cardboard box with our folders and our KM-101 stands). 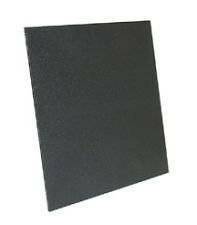 TEXTURED BLACK PLASTIC SHEET - 24" x 12" x 1/8"
I love my Peak stand, which I leave in my car. The carrying case is large enough that I can just barely squeeze in a collapsible guitar stand for my bass gigs. It's these little accessories that I regularly forget, so keeping them in the car is a great option. My only gripe is the wide base. It definitely keeps the stand more stable, but gives less floor space, and makes it easier to trip on for standing gigs. BopEuph wrote: I love my Peak stand, which I leave in my car. The carrying case is large enough that I can just barely squeeze in a collapsible guitar stand for my bass gigs. It's these little accessories that I regularly forget, so keeping them in the car is a great option. Though precarious/risky to not open it as large as possible, the KM101 stand's tripod can be adjusted to any size...even (if absolutely necessary) to fit on a single step within some old "sardine-can" Baroque-style choir loft. Last edited by bloke on Thu Jan 10, 2019 10:36 am, edited 1 time in total. Tell me about you playing stand and drum throne. Three Valves wrote: Tell me about you playing stand and drum throne. The drum throne is a fairly basic one, I have used it for a couple of months together with my new 6/4 Cc tuba. I had difficulties finding a good position on regular chairs, so I decided to try a throne. So far - success! I don´t miss the backrest, and I can position myself quite comfortably. The tuba stand is a Hercules DS553B stand, I have strapped some rubber bands around for better friction, but I am looking for a better and more permanent solution, maybe a bicycle inner hose, split and glued to the stand. I have also bought myself a suitcase for all my equipment, the new stand is unfortunately a bit too big to fit in, but I carry it as a separate item. Thanks. I thought the playing stand looked familiar (I have one) I heard elsewhere that the drum throne was worth a look. I don’t need a back rest since I don’t perform in back of an orchestra counting measures!! What brand is it, is it adjustable, and can it hold up 230+lbs? ?